I have encountered various types of environmentalists with the aim of reducing their plastic waste, advocating for a greener community, and performing beach clean ups to minimise environmental damage. Many of these self- pronounced ‘environmentalists’, however, fail to address the critical issue of animal agriculture as a severe cause of climate change. Firstly, we all know that there is an astounding amount of plastic lurking in the depths of our ocean. There are various initiatives people have taken to curtail the damage, but many are unaware that one of the most common items found underwater is not plastic straws, cigarette butts, plastic bags, or plastic rings, but rather, an abundance of fishing nets - a product of aquaculture. In short, aquaculture refers to the farming of fish and other sea creatures to satisfy the diets of our population, but the often overlooked aspect of this practice is the overfishing. When fish farmers fish for their required species of marine life, their nets simultaneously capture everything they need plus more. This in turns results in an unnecessary load of animals put to death for no purpose other than convenience - causing a lack of substantial biological life to sustain into the future. These fishing nets trap animals and prevent then from moving freely; they strangle the coral, which are significant contributors to biodiversity, and they enter the digestive systems of marine life. Additionally, the irreversible construction of plastic means that instead of decomposing over time, it only breaks down into smaller and smaller particles known as micro-plastics. Not only do these micro-plastics negatively impact the state of our environment and marine life, they are shown to contaminate our food and even our water supply. Through a process known as bioaccumulation, the particles that are ingested by sea creatures end up in larger amounts at higher levels of the food chain (meaning us). This plastic infiltrates any source of ‘clean’ water available and is detrimental to the health of sea life, ourselves, and the environment. Aside from avoiding single-use plastics, we can significantly reduce our environmental impact by eliminating the need for fishing nets in the ocean, and this can be easily done by decreasing the demand for seafood. Secondly, due to the high demand for beef and the level at which beef needs to be produced, cows are often placed under concentrated and industrial rearing environments which not only increase the harm posed to agriculture animals, but their diets are commonly altered from their natural grass-fed diets to that of grains such as corn and soy to accelerate growth. Corn that is fed to cows are often grown in monocultures, meaning that an abundance of land is required to grow the single crop. In order to produce corn at great rates to feed the cattle, many nutrient fertilizers and pesticides are also required. These fertilizers can seep into lakes, rivers, and oceans, causing algae to grow and spread, and eventually depleting the water’s oxygen supply. At some oxygen depleted zones, many sea creatures are unable to survive. Additionally, some versions of corn that are genetically modified to eliminate pests contain toxins, and when parts of these plants wash into oceans or other environments, other insects are also affected - putting other species in the ecosystem at risk as well (Bardroff, Jenna). Similar to corn, many herbicides are used to accelerate the production of soybeans. To make space for the cultivation of soybeans, many rainforests in the amazon have been destroyed. 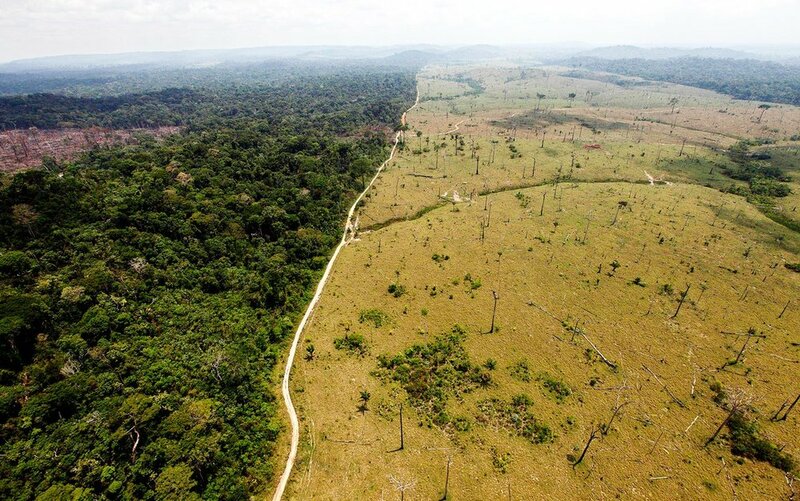 Not only does deforestation of the tropical rainforest increase atmospheric Carbon Dioxide (CO2) levels, but it also removes the trees that convert CO2 into oxygen. Thus, an abundance of soil carbon can also disappear as plants and dead organic matter are removed. Rainforests store most of their nutrients in living matter; therefore, the destruction of trees causes large amounts of carbon to be released into the atmosphere. In Brazil alone, over 473 million tons of carbon dioxide have been released to make space for soybean plantations. Additionally, soybeans are commonly produced on land that is highly susceptible to soil erosion, easily exhausting the soil’s nutrients and value to the ecosystem. Plenty of water is also needed to grow soybeans, and approximately 530 gallons are required just for two pounds. (Bardroff, Jenna) Because of the vast amount of resources needed to raise cattle, approximately 27% of the world’s water ‘footprint’ can be attributed to the production of beef; the amount of water used to grow crops for animal feeds is a highly inefficient use of a precious resource, and it also reduces freshwater reserves ("Health & Environmental Implications of U.S. Meat Consumption & Production."). When all of this is added up, one quarter-pounder burger requires 660 gallons of water in total to produce, and it takes upwards of 3000 litres of water to produce one steak. To treat water and transport meat, the energy required is 35 times more than what you’ll get out of eating it. The problem arising from methane emissions is not a one-off occurrence. Under high pressures and cold temperatures, methane molecules are trapped in water molecules that create a chemical cage - a clathrate - around them. When temperatures rise as a result of climate change, these clathrates become unstable and melt into water and release the stored methane gas. These are commonly found in the deep ocean where water pressure is high, and as the climate changes, the methane deposits expand into gas. On average, a cubic meter of clathrate contains 164 cubic meters of methane gas. (Podbury, M. J). As a result of climate change, more methane is leaked. This then turns into a positive feedback loop - a process that causes changes to amplify ("Feedback Loops.") - where more warming leads to more methane, and so on (Andersen, Claus). In response to global warming caused by CO2 emissions, the melted ice releases methane. This causes the oceans to rise, and the rising oceans generate more methane - which is conducive to more warming. This continues in an endless cycle of destruction; methane acts on both the atomic and geographical scale, and although its effects are not fully understood, it is clear that it is detrimental toward our environment (Podbury, M. J). Climate change is conducive to greater occurrences of extreme weather, and milder winters and extended summers enable tree-killing insects to thrive. With higher occurrences of drought, the defence systems of trees are also lowered, meaning that it is easier for them to die. With less trees, there is more carbon dioxide present in the atmosphere, resulting in a continuous cycle of damage toward the environment. Bardroff, Jenna. "How the Food We Feed Farm Animals Is Destroying the Environment." One Green Planet, www.onegreenplanet.org/animalsandnature/livestock-feed-is-destroying-the-environment/. Accessed 12 Aug. 2018. "Causes of Sea Level Rise: What the Science Tells Us (2013)." Union of Concerned Scientists, www.ucsusa.org/our-work/global-warming/science-and-impacts/global-warming-impacts#.W2_Tm9gzbq1. Accessed 12 Aug. 2018. Cowspiracy. Directed by Kip Andersen, produced by Keegan Kuhn, A.U.M. Films; First Spark Media, 2014. "Effects of Climate Change." World Wildlife Fund, www.worldwildlife.org/threats/effects-of-climate-change. Accessed 12 Aug. 2018. "Health & Environmental Implications of U.S. Meat Consumption & Production." Johns Hopkins Bloomberg School of Public Health, Johns Hopkins University, www.jhsph.edu/research/centers-and-institutes/johns-hopkins-center-for-a-livable-future/projects/meatless_monday/resources/meat_consumption.html. Accessed 12 Aug. 2018. Nagle, Garrett, and Briony Cooke. Geography for the IB Diploma. PDF ed., Oxford UP. Podbury, M. J. "Causes of Global Climate Change." IB DP Geography, www.ibgeographypods.org/a-causes-of-global-climate-change.html. Accessed 18 Sept. 2018.